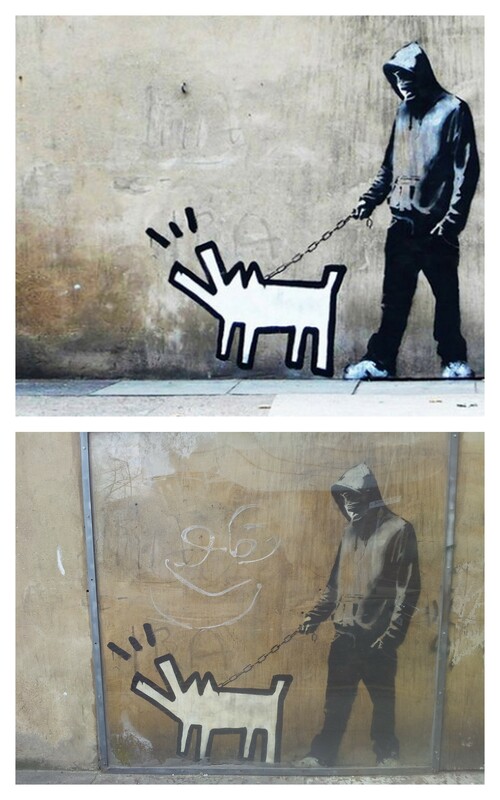 I guess it’s fair to expect a challenge when hunting down street art by Banksy. The elusive artist’s graffiti is sold, dismantled or defaced so often that it’s hard to ever find his writings on the wall. 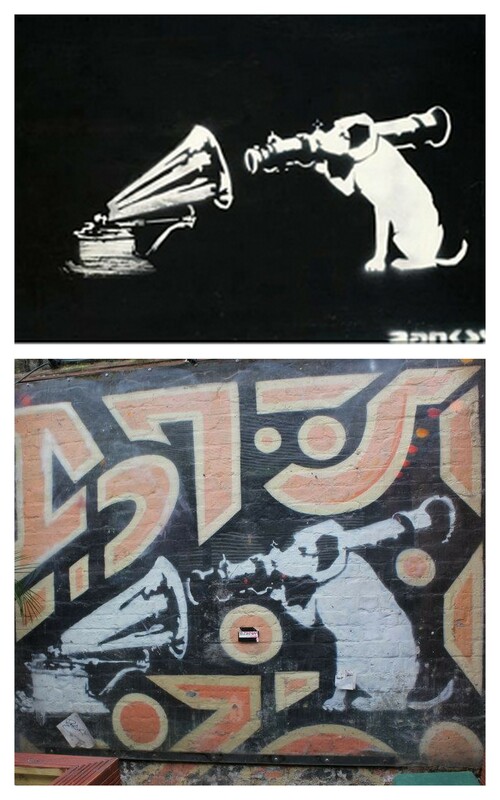 Frustrated, I tracked down 11 pieces and mapped out a Banksy Art Crawl in London! It’s a full day of art, so I’ve sliced it up by neighbourhood in case you want to take a piecemeal approach. 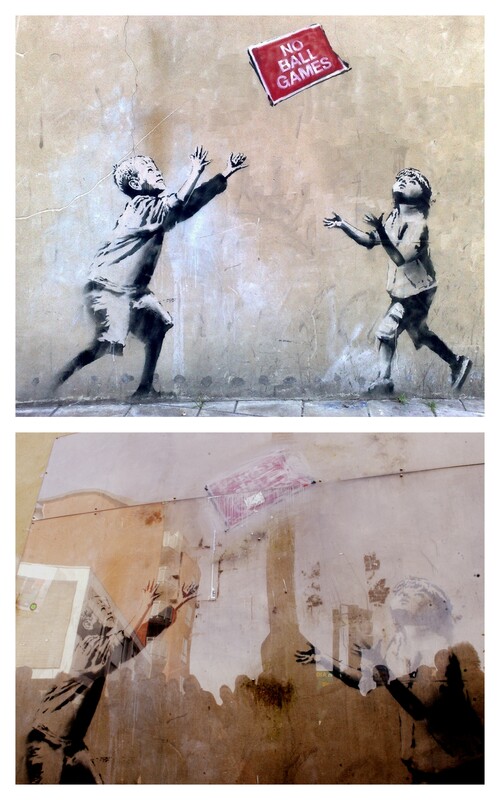 I’ve also included photos of each Banksy piece in its original and current state. 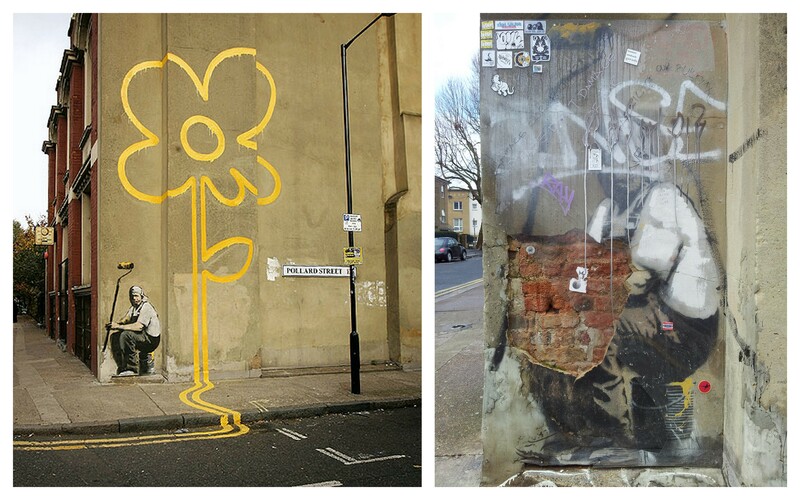 Here’s a separate map of ALL Banksy sites that I visit to create your own crawl. Walk through one of the poorest boroughs in London to see Ball Games on High Road. It’s just a 10 minute walk from Seven Sisters Station. It sits behind a heavy sheet of perspex and is in relatively good condition. Next, visit the Royal Family in Stoke Newington. The piece is exposed high above the ground, but looks lowly as it is partially covered in black paint and sits beside an abandoned lot. 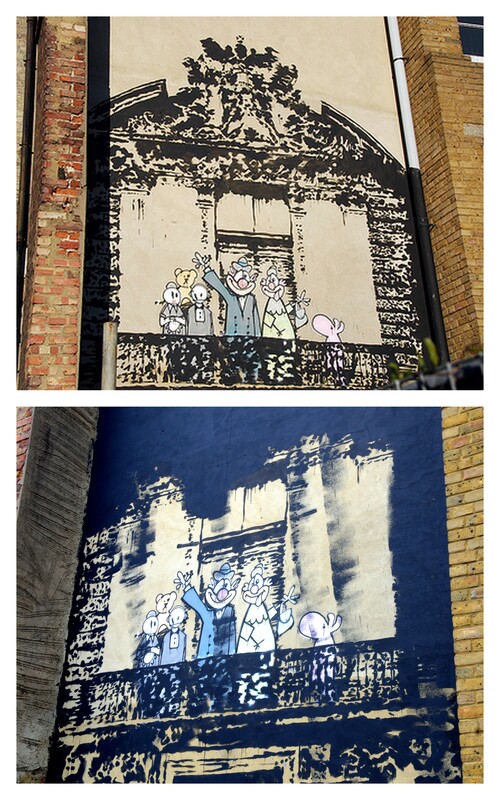 Apparently, the city council painted over it even though the building owner wanted to keep it! 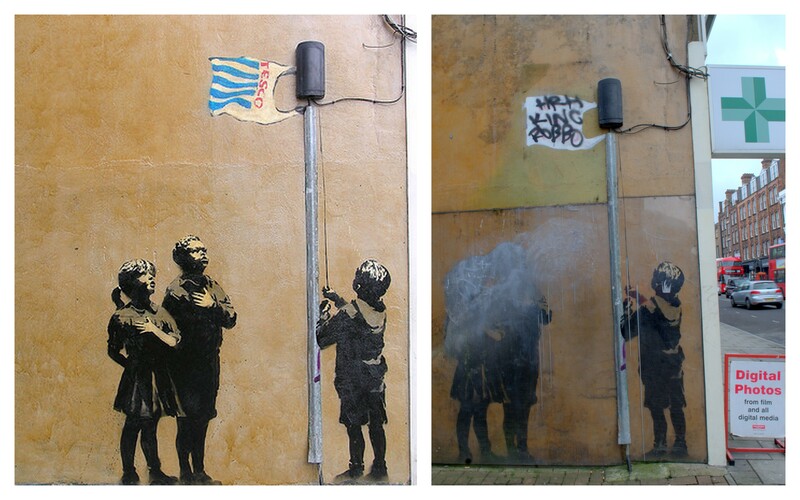 The band Blur refashioned the controversial Banksy stencil into their Crazy Beat album cover. Then head off to Essex Road and keep an eye peeled for a green medic’s cross protruding from a pharmacy. 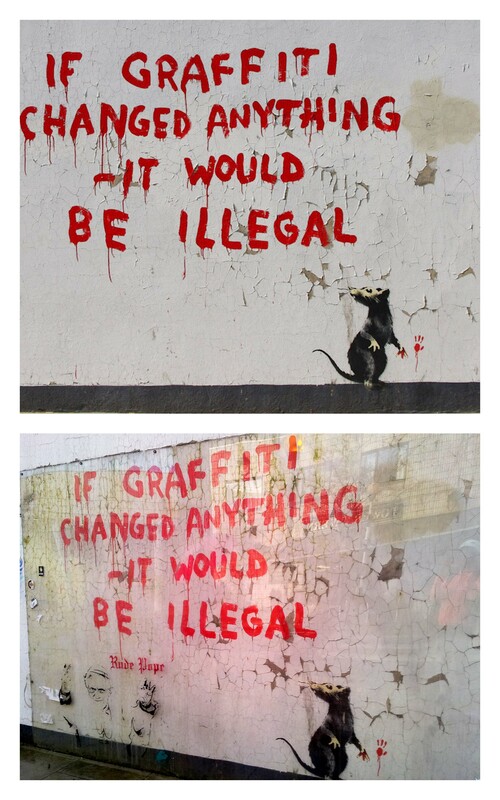 Banksy’s Very Little Helps will be on the exterior of the pharmacy wall. Even through it’s protected by a sheet of perspex, the Tesco bag and children’s faces are no longer visible. Get snack happy a few doors over at Banksy’s Coffee House hosting smooth jazz and Banksy clad-walls. 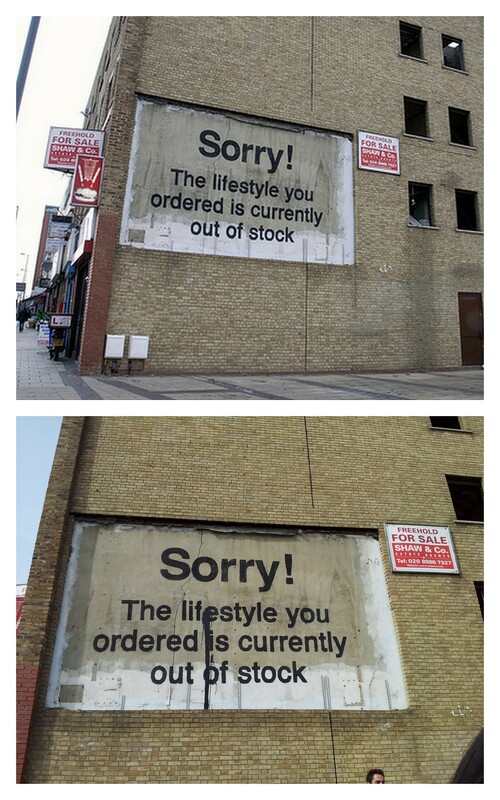 A convenient location for you to ponder ownership rights when it comes to street art. Before you leave the area, traipse around Upper Street in trendy Angel – the neighbourhood where you’re most likely to spot a yummy mummy. Meander through Fitzrovia’s abundance of cool, yet cosy pubs and restaurants. Albeit close to Oxford Street, it stands apart from the tourist zone. Shielded by a wall of perspex, If Graffiti Changed Anything is close to it’s original condition and bluntly tackles the grey area where graffiti lives – art or crime? Get ready to be jostled around because the world famous shopping drags of Oxford and Regent Streets are always heaving with crowds. Take a peek at the street entertainers and pop into classic London shops – Selfridges, Liberty, Hamleys – before drifting into the luxury of Mayfair, the neighbourhood where you find people with personal shoppers. 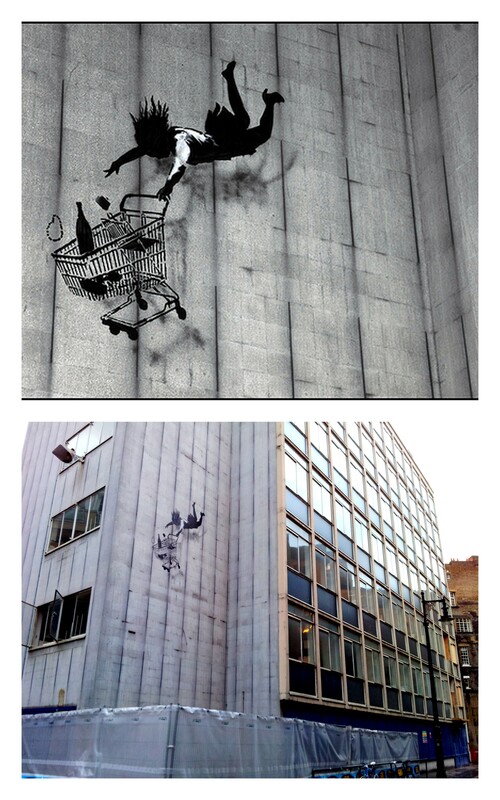 Makes sense that Banksy chose this location to illustrate the Falling Shopper as she shops to her demise. Lunch! Dip into Borough Market to sample your way through the myriad of food stalls and let your senses lead you to your next meal. London Bridge is a stone’s throw away from the market too. Well fed, we continue walking and head for the polished and artistic Bermondsey Street. It looks dodgy at first, but stick with it as independent galleries, restaurants and bars soon begin to surface. Eye-ball them all as you walk by and grab a pint at one or all of them on your way back. In a grungier area beyond Bermondsey Street, you’ll find Choose Your Weapon. Well preserved in perspex, what do you think this says about British youth? Beware the chav (Council-Housed And Violent), which is a stereotype for a young thug. As you head back to the station, don’t forget to knock out your post-lunch palette cleanser. Drink? Your pint awaits a short jaunt up Shoreditch High Street in Cargo‘s backyard garden. While Guard Dog is preserved behind perspex, consider the heavily altered His Master’s Voice. Is it vandalised? 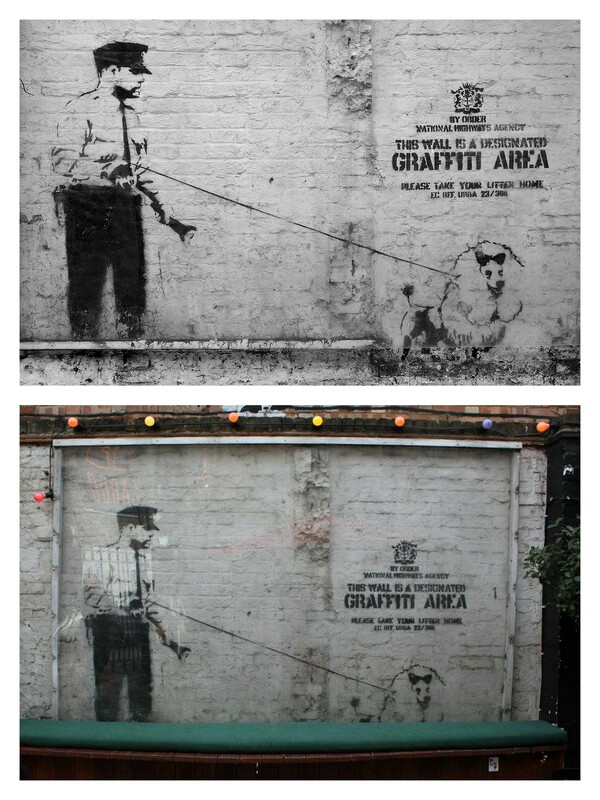 Or is defacing and altering street art a part of graffiti culture? Shoreditch is rife with graffiti and creativity oozing out of its rough edges, so cruise the ‘hood, have a tipple and see how many hipsters you can spot. Alternatively, transition over to Brick Lane and hit up a Bengali curry house. Extra: If you’re hungry for more, trek up Bethenal Green Road to view a once glorious Yellow Line Flower Painter, but despite the perspex, it is in serious disrepair. Wow this looks really great. I definitely have to check some of this out when I’m in London. You absolutely should! 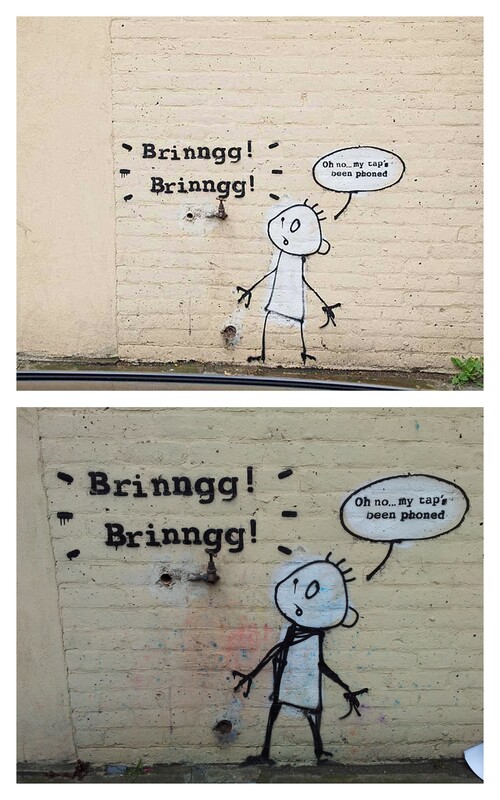 I always hear people talk about Banksy in London, so when I found myself with nothing to do one sunny Sunday… I joined a Banksy art tour. After 8 hours, we only saw 4 pieces and there was so much backtracking. Total waste of time. So after a few internet searches, I took to the streets on my own the following weekend. I’m such a nerd :).